Four of the categories are taken up with the visual brand. 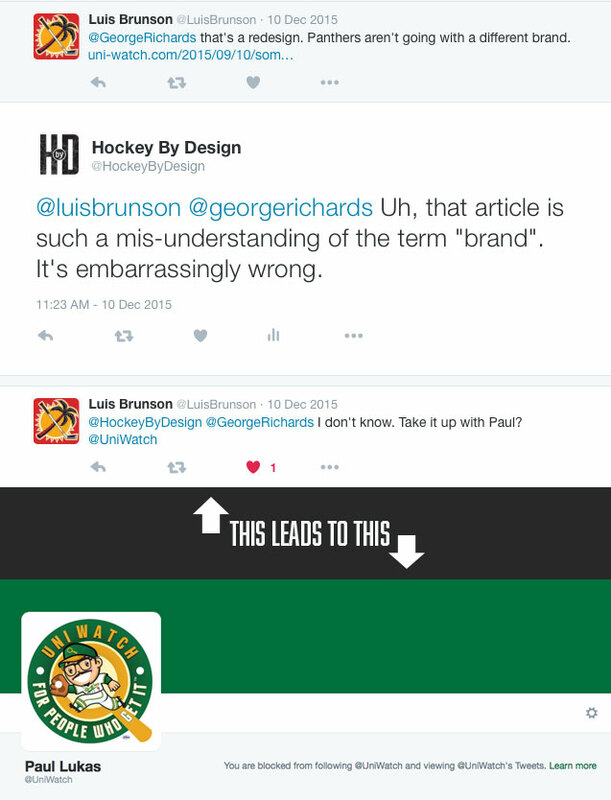 And again, this is not just my subjective opinion, but the combined opinion of all three writers for HbD – all professional designers and hockey fans. In future rankings, we hope to include more designers in the process to get an even more precise ranking. If you’re a professional designer and want to be involved next time, definitely let us know. *Special event uniforms only from 2015-16 were included. If a team did not have either (a) a third jersey/uniform or (b) a special event uniform from 2015-16, all jerseys/uniforms than positively affected a team’s brand were ranked above these teams, and all jerseys/uniforms that negatively affected a team’s brand were ranked below. These categories are where I borrowed heavily from outside sources than using their own statistical methods to determine their rankings. I’ll explain each one individually. It’s a tough one to quantify. Using social media account followers, for example, would be skewed based on the population base of that team’s location. So, we needed something that was a percentage based metric and tends to wax and wane depending on a team’s performance, their physical location, and the dedication of their fans…ticket sales. Specifically, their arena capacity percentage over the 2015-16 season. After all the other categories described, they’re not worth much if the franchise isn’t making any money. No matter what, an organization’s worth affects their brand. Every time Apple’s stock goes down, for example, it affects their brand. So we wanted to make sure this aspect of a brand was reflected. 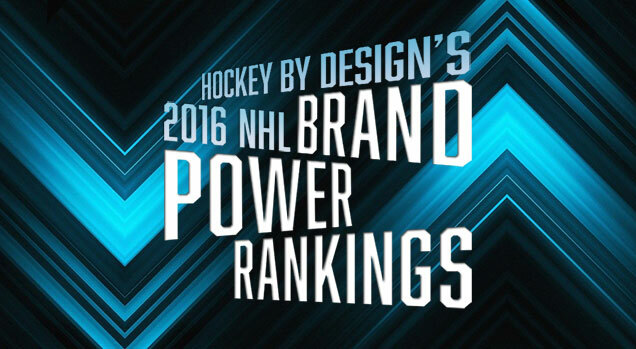 Now that you understand exactly how the process went, it’s time to unveil the definitive 2016-17 NHL Brand Power Rankings. 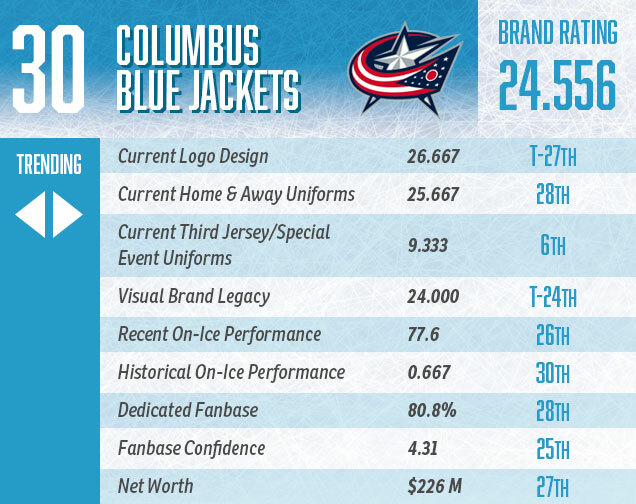 What kills Columbus is their on-ice performance, both recently and throughout their existence, never getting past the first round of the playoffs. That’s created a lack of interest from their fanbase, who have no confidence that it’s going to get better anytime soon. Throw in a mediocre visual brand (aside from their third jersey), and that will all land you in last place. 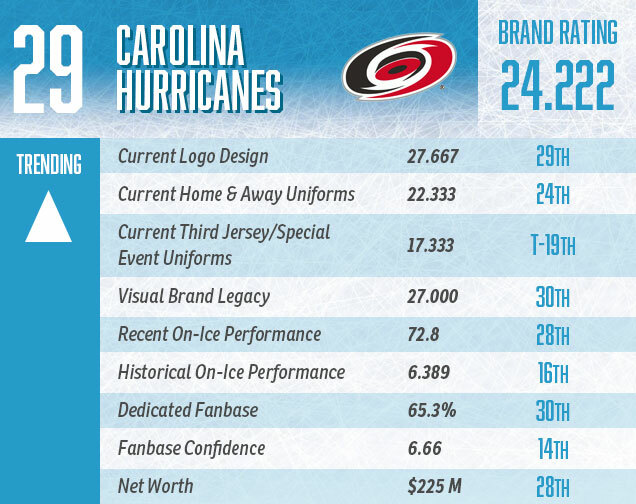 Nobody seems to like Carolina’s logo or visual brand history (remember, we’re not counting the Whalers in this), and they haven’t been good recently. 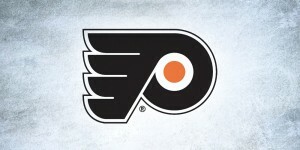 Without their one Stanley Cup victory in 2006 propping them up, they’d probably be in last place. But, their fanbase’s confidence with new management at the helm seems to indicate that improvement could be coming. There’s no question that Arizona is forming a great young team and will be moving forward in the coming years, but they haven’t seem much on-ice success in their past aside from their Cinderella run in 2012. Their recent uniform change was also a step back. Another team that’s definitely trending upward with an unexpected division championship last year, a new visual brand and a new outlook on life, expect Florida to jump up the rankings after this year. The visual brand improvement definitely helped as well (although still not close to among the league’s elite), they’ll climb with the additional on-ice success that’s expected of them. 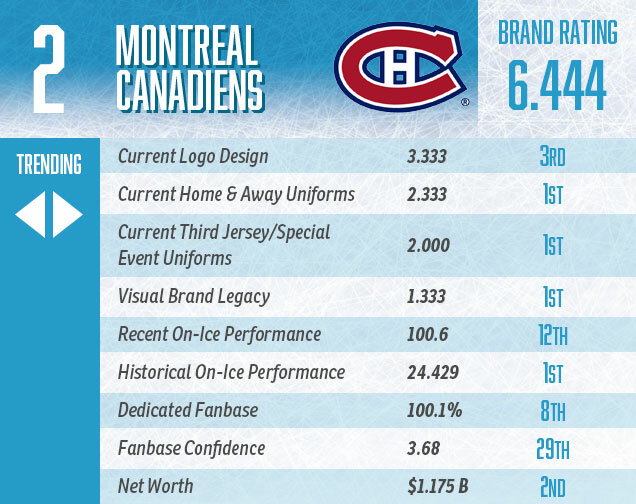 Their visual branding is among the worst in the league, and it’s buoyed by their historical on-ice successes over their relatively short lifespan (remember, we’re not counting the Nordiques). Their recent on-ice performances haven’t been noteworthy however, and the fanbase isn’t confident it will improve. The recent strings of last (or near last) finishes is what kills the Sabres. Their visual brand could use some minor improvements, but things are trending upwards with a solid young team that could make some noise in the upcoming seasons. No Stanley Cups definitely hurt too. 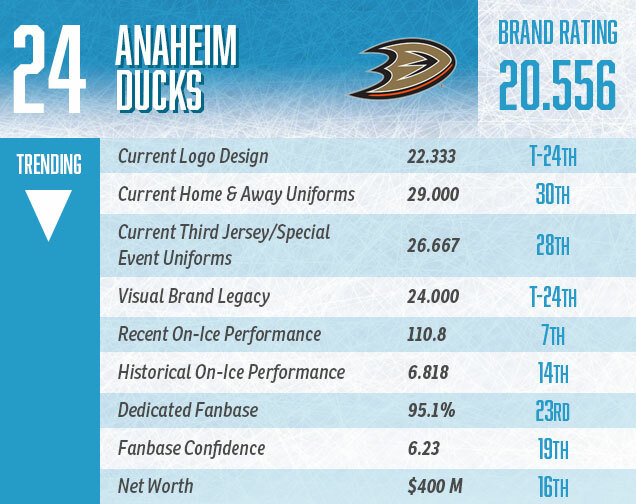 The Ducks, despite their recent competitiveness and 2006 Stanley Cup victory, are being destroying by their visual brand, especially their league-worst jersey set and mediocre logo. And their competitiveness may be slipping against their California cousins, or so their fans seem to think. The lowest Canadian team, their era of on-ice success (culminating in a trip to the 2007 Cup Finals) is bookended by years of not much, getting to the Conference Finals only one other time. 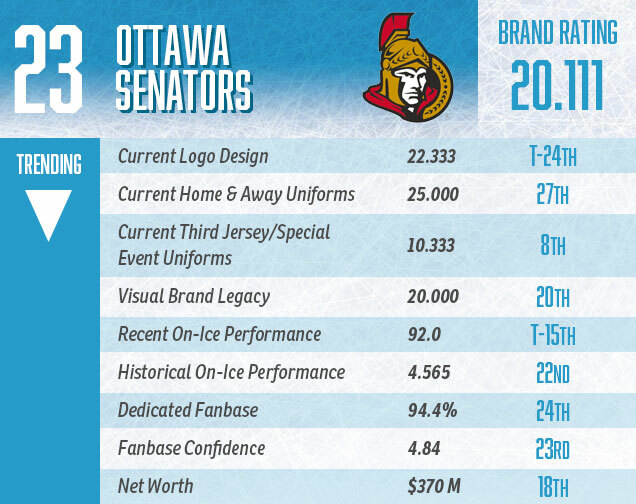 Their visual branding – aside from their historical third jerseys – doesn’t excite either. And the fanbase doesn’t seem to think things will get better anytime soon. 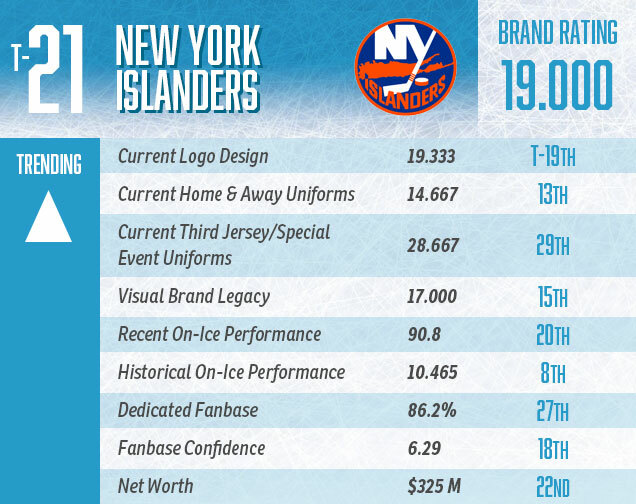 A tie at 21st bring into the light the Islanders, those of the fish stick logos, the seasick jerseys and one of the worst current third jerseys in the league. Their early-’80s power house team is keeping them afloat, as the decades that followed that era was predominantly disastrous (thanks Mike!). 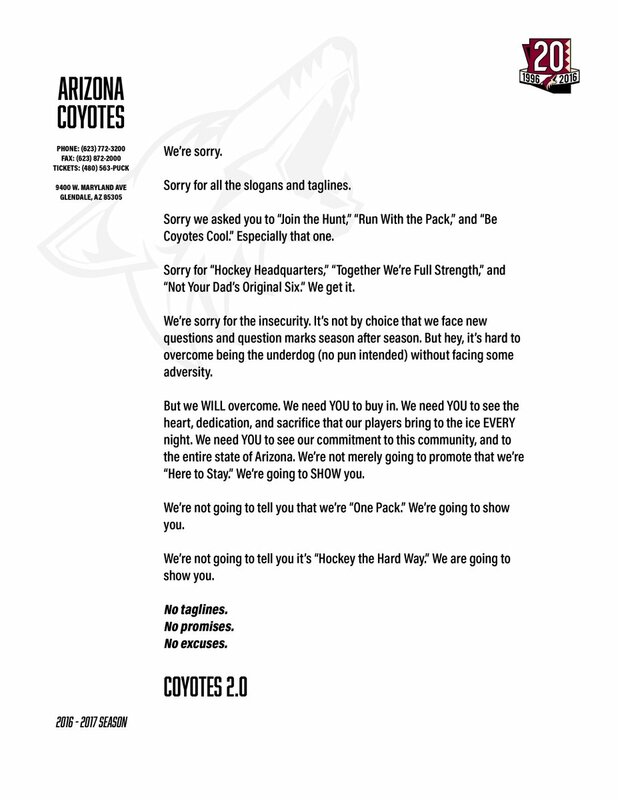 But, their return to their original visual branding helps things, as will better on-ice results. The fanbase seems lukewarm on much improvement though. 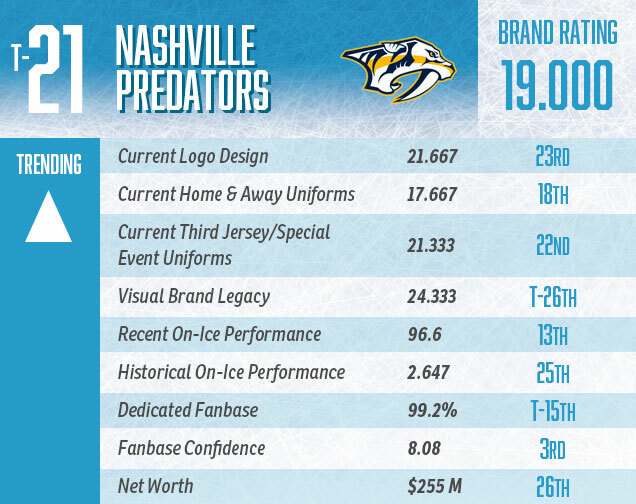 There’s no question that Nashville is trending upwards. They’ve got a fearsome team, a pumped-up fanbase and are most likely only to improve their on-ice performance results. Their visual brand isn’t considered great, although it’s an improvement over their past logos/jerseys. Their recent decade on relative ineptitude on the ice has hurt the Flames here, along with their not-great jersey set. Improve those and – along with a great logo and decent brand legacy – they’ll likely jump up. But, at the moment, almost every category can best be described mediocre. New Jersey’s buoyed by their three Stanley Cups and dragged down by their uninterested fanbase. Four years without the playoffs will do that, despite their 2012 run to the Cup Finals. And for a team that has always feared any sort of visual brand alterations, they’re probably due for a jersey re-fresh. 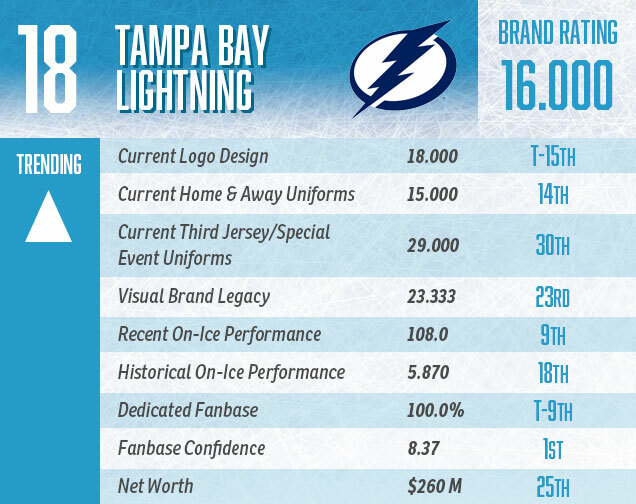 I was surprised to see the Lightning this low, but then I remembered their league-worst third jerseys, the incredibly awful jerseys from their past, and their numerous seasons of being just plain bad. These new(ish) logo and jerseys propel them up, as does their recent success which will – by all accounts – continue in the coming years. The fans love them too, so they’re definitely trending upward. Winnipeg is both helped and hindered by being the newest team in the league. 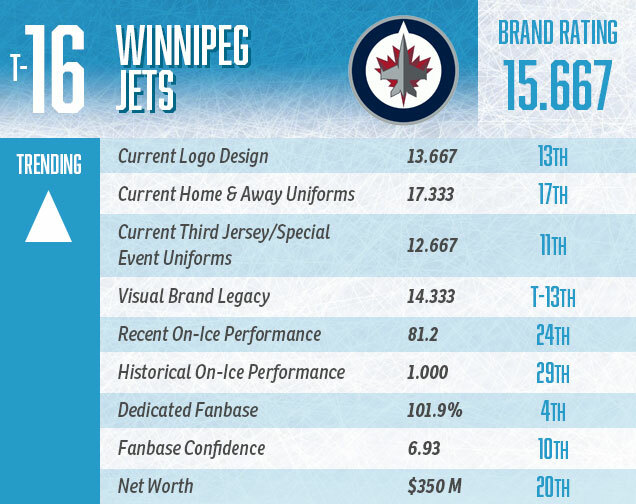 They have a dedicated fanbase that craved a return of the Jets to Winnipeg, but as most new teams, they’re struggling with the on-ice performance aspect. After five years, it looks like things will keep improving with that, and they have a decent visual brand to compliment that. 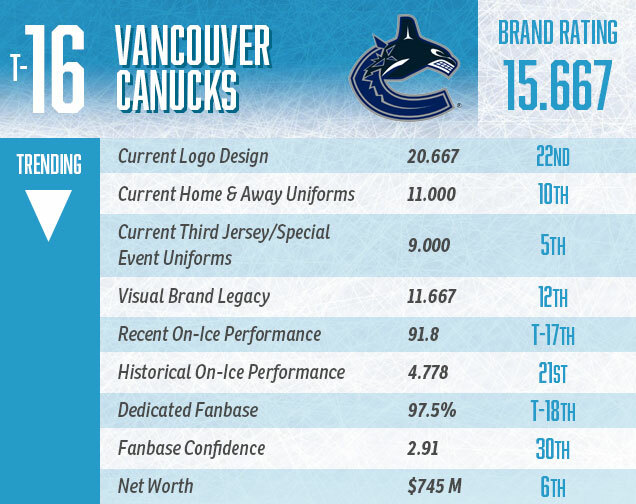 The Canucks are being killed by their fanbase, which has seemingly abandoned the Canucks, both in attendance (they used to have no problem selling out their arena) and confidence (last in the league). Their jersey set is in the upper tier of the league, but with no recent success (and none seemingly coming soon) and no Cups, they’re trending down. After years of being known as chokers, the Sharks finally ditched that moniker after last year’s Cup Finals run. The fanbase is confident (but still somewhere un-dedicated? 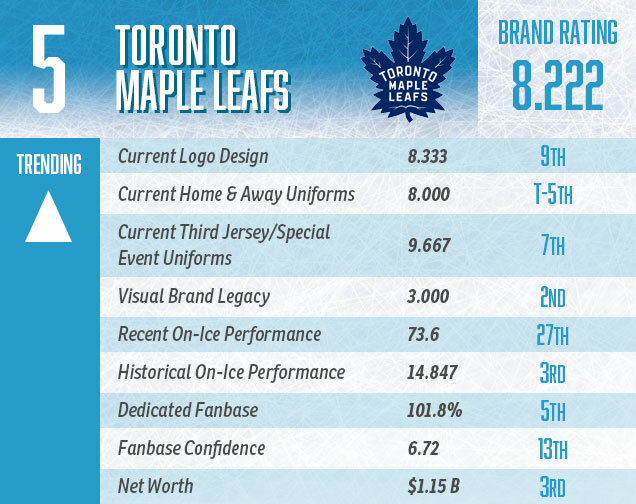 ), but a mediocre visual brand also hurts them, as does their historical on-ice performance. But a few more long playoff runs will see their stock rise. 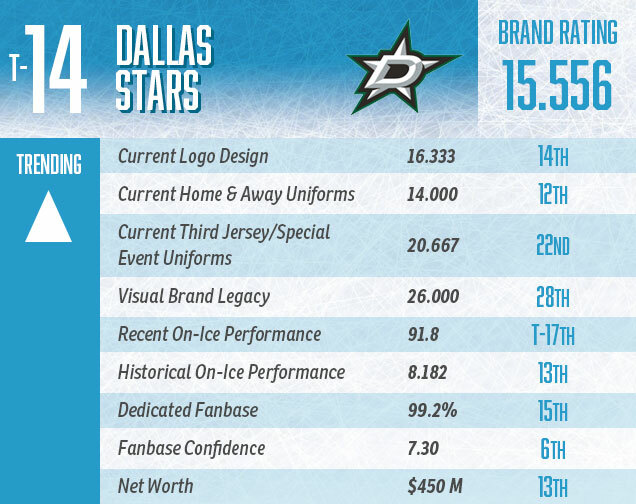 A rise to prominence in the standings is helping Dallas trend upward, as is their revamped logo and jersey set (the latter of which is in the league’s elite imo). But, their visual branding’s past has been horrendous for the most part (remember the uterus jersey? ), and that’s tough to shake. More playoffs and long playoff runs will help though. Minnesota’s rabid fanbase propels the Wild upward despite a low confidence level, which is a testament to how dedicated they are to their team. The recent (and historic) on-ice performances haven’t been good, and stuck in a tough division, it’s unsure whether we’ll see any improvement. What does help? Having a killer third jersey and a decent visual brand. They haven’t been great in the past, but the current Capitals are definitely among the top contenders in the league. The fanbase is engaged, interested, and ready for most of the recent on-ice success they’ve enjoyed. 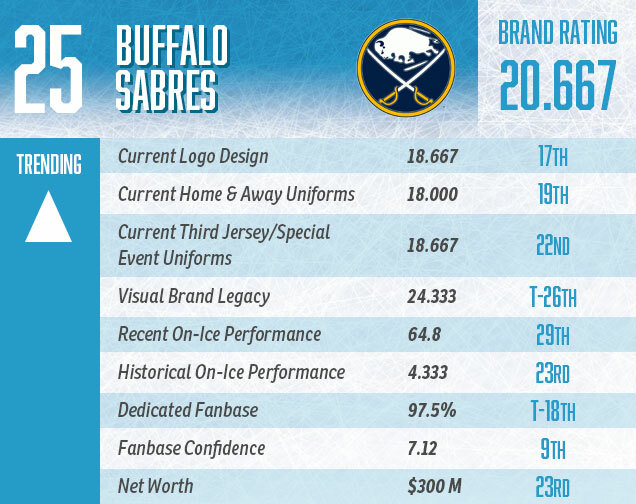 Too bad the logo and jerseys don’t quite keep up that same pace. That visual brand…ooof! Given their recent strings of success – including two recent Cup wins – all they’d need to do is change their logo to something better (or anything else from their history) and they’d jump up some spots. With that unlikely to happen, and with a surprising lack of confidence in their fanbase, they’re likely to tread water for a while. A story of extremes, Edmonton’s won more Cups than the vast majority of the league, and have been absolutely terrible for the last decade, with several last-place finishes and no playoff appearances. McJesus will (finally/probably) help that category, and their above-average visual brand keeps them barely in the Top 10. Despite a relatively low net worth (the lowest of any team ranked this high), they may actually improve in that category (along with their fanbase’s dedication) with the departure of the Rams to LA. They’ve also been a contender for a few years now, and finally improved their jersey set to reflect what’s one of the best logos in the league. 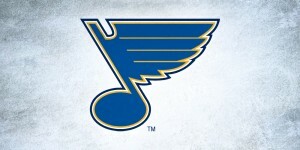 The Blues are also the highest-ranked non-Cup-winning team. The visual brand and the Flyers’ relatively-consistent competitiveness (and a couple Cups) push them up this high. The logo is, and always has been, among the best in the league. They haven’t been great recently, and the fanbase is lukewarm on that changing anytime soon it seems. The Original Six teams are dominant brands in the league (with history usually comes legacy and becoming iconic), and they take up 6 of the top 7 spots. 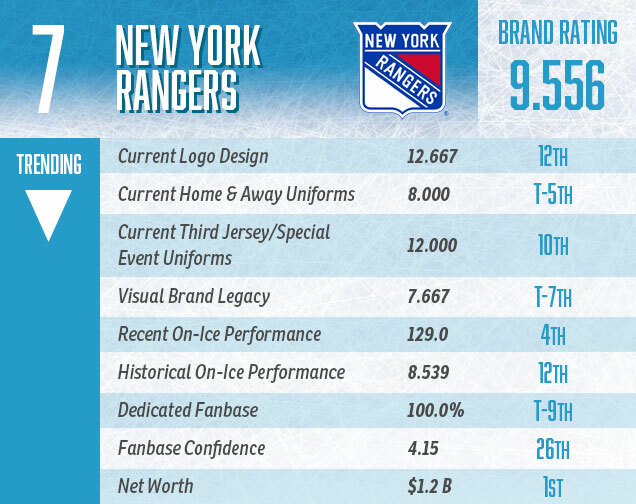 The Rangers’ net worth is miles above most of the majority of the league, and they’ve had a couple good runs lately, but the fanbase isn’t confident that’s going to continue. 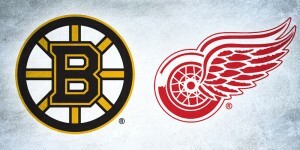 They’re easily the weakest of the Original Six teams. Detroit is killed by two things: their Stadium Series jerseys from last year (which won’t count next year…unless they use them again), and the fanbase’s lack of confidence. In all other categories, they are among the league’s elite, including having the best logo in the league. Having a 25-year playoff streak certainly doesn’t hurt that, despite not making any deep runs recently. How does a team that has been near or at the bottom of the standing for several years get ranked this high? 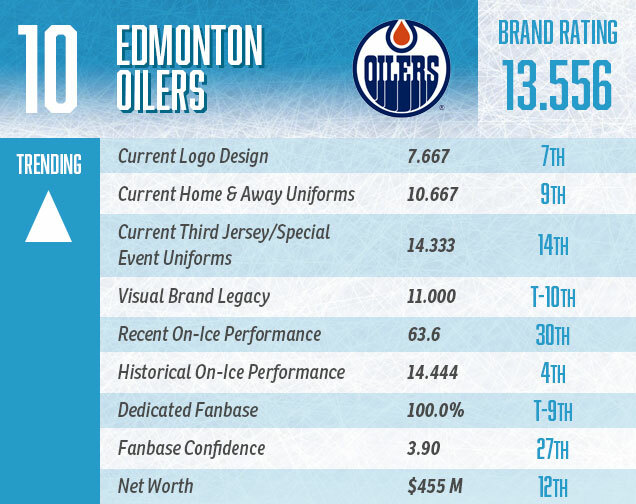 With a great visual brand, a rabid fanbase and the second most Cups in the league, that’s how. If their on-ice performance starts climbing, so will they in these rankings. 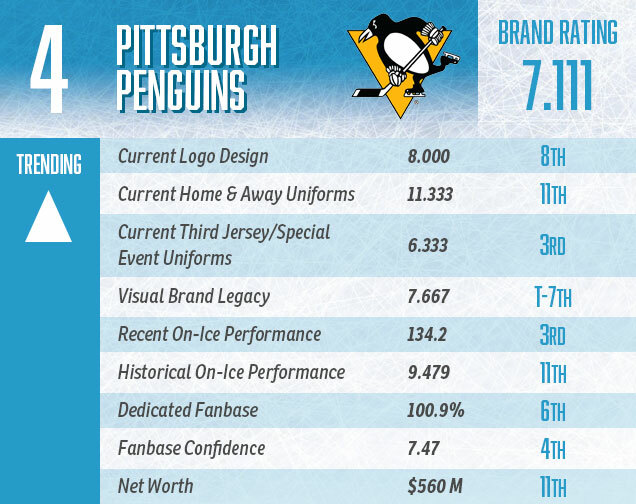 The only non-Original Six team in the top spots, the Penguins get this high on the basis of their great visual brand (including logo and jerseys), their recent accomplishes (a 2016 Cup, of course, as well as a 10-year playoff streak), and a fanbase that’s dedicated and engaged. And things don’t seem to be going to change anytime soon. In fact, their brand new jersey set is generally considered an improvement. The fanbase is concerned. And maybe they should be with the Bruins missing the playoffs that last couple seasons and appearing to be a bubble team once again. But everywhere else, they’re a force. Recent success + historical success + one of the best visual brands in the league = a tough brand to beat. Just like the Bruins, this is a team dragged down by the lack of confidence of their fanbase. Otherwise, they dominate. By far the best historical on-ice performance – 24 Cups will do that. As will wearing the best jerseys in the league. But the on-ice performance in the upcoming seasons will tell if they can climb to the top spot anytime soon. The Blackhawks are the closest thing modern hockey has to a dynasty, with 3 Cups in the last 7 seasons. 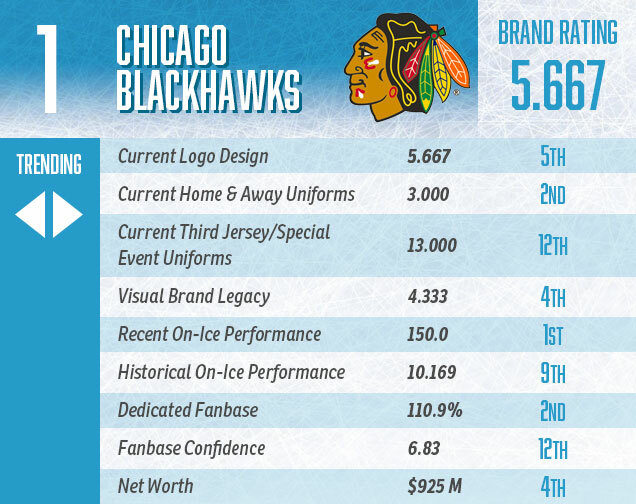 With a visual brand among the best in the league and a rabid fanbase that is relatively confident in their ability to continue their dominance, it’s hard to think of a brand that’s more prominent right now that the ‘Hawks.